After reading through numerous layout threads here, I thought I would start my own in hope that it will help keep me on track. 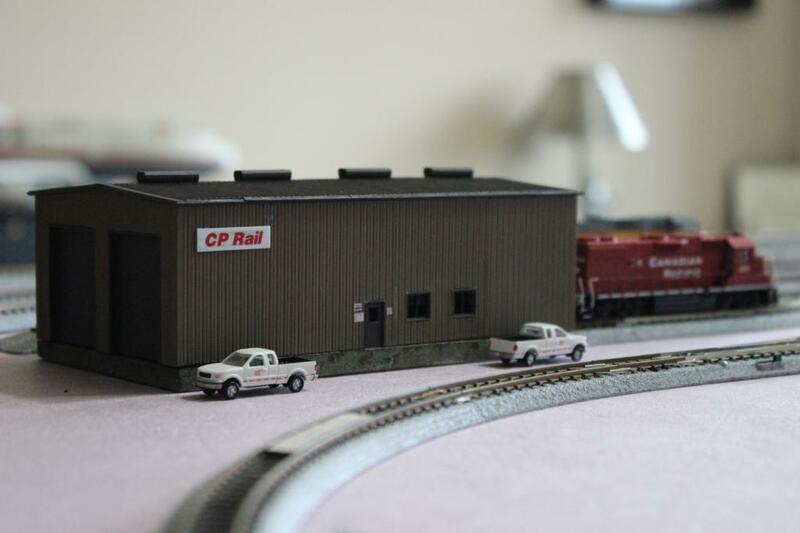 My two main requirements for the layout were that it be Canadian Pacific and have mountains, as this is what I was a fan of growing up in Alberta. As careers keep us somewhat mobile, a tertiary requirement was that the layout be somewhat mobile as well. So, after looking at and drawing out many track plans, we (my oldest son and I) decided upon Model Railroader’s Salt Lake Route track plan as a starting point. The scenery could easily be adapted to resemble southern Alberta, and while not very prototypical for CP through the mountains, the double track mainline allows for the operation of two trains simultaneously which will reduce bickering amongst my two young helpers. And thus, the Canadian Pacific Spring Creek Subdivision was born. 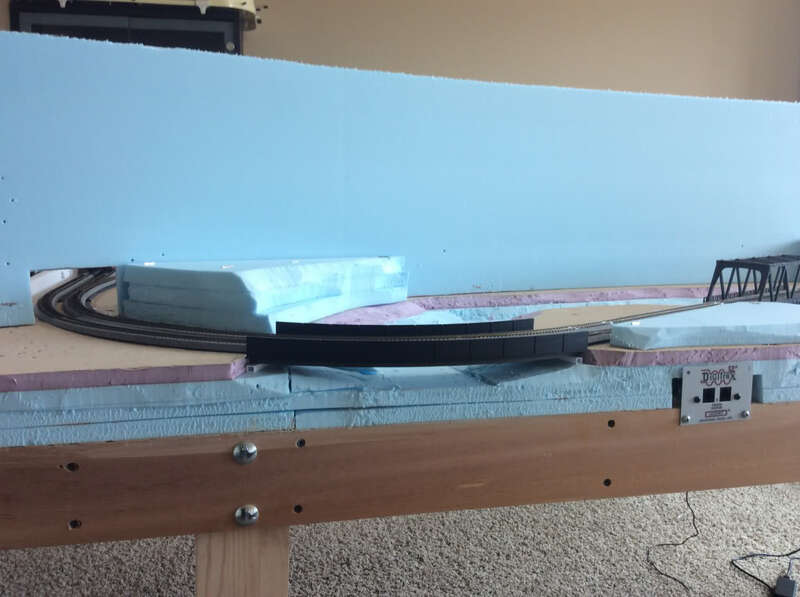 The Kato Salt Lake Route track pack was purchased in January 2013 and quickly assembled on a 4’x9’ foam base resting atop an air hockey table. 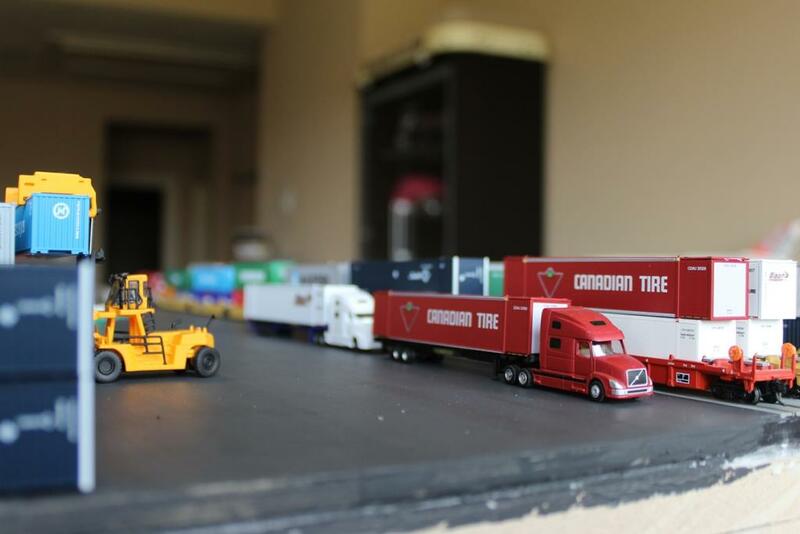 Over the next year the beginning of some foam mountains were placed and the track plan was constantly tinkered with and some additional pieces were purchased until we had something we were really happy with. This ability to tinker was a definite plus for the Unitrack. The current, and dare I say final, incarnation of the layout is shown below. 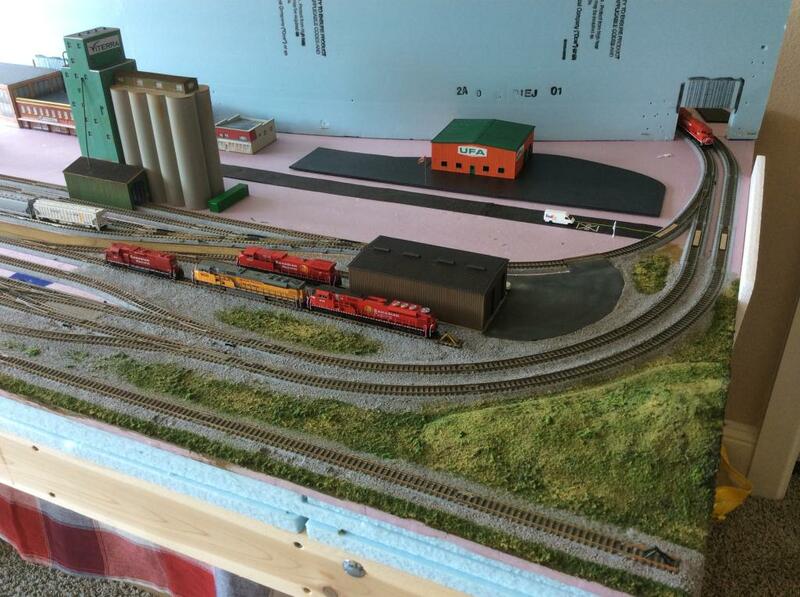 Modifications to MR’s plan included relocating the engine facility from the left side of the layout as pictured to the right to allow for a larger town area and eliminate the diamond to increase storage track; addition of storage tracks as well as a yard entrance track for the grain elevator (was a furniture factory in MR) so that we don’t always have to reverse a train into the facility; and addition of an interchange track, which may one day lead to a staging yard. As well, the layout is a full 4’x’9’ rectangle as opposed to being trimmed to 3’ on the right side as was MR’s. This allowed the addition of the yard entrance. 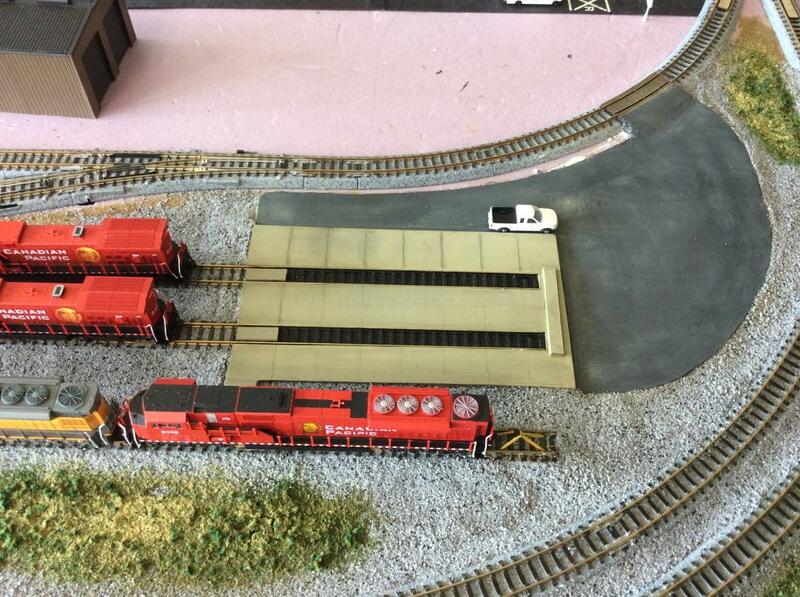 I have also used several Kato #4 turnouts to reduce track centreline spacing. These are finicky, but, with a little bit of work, they do the job nicely. 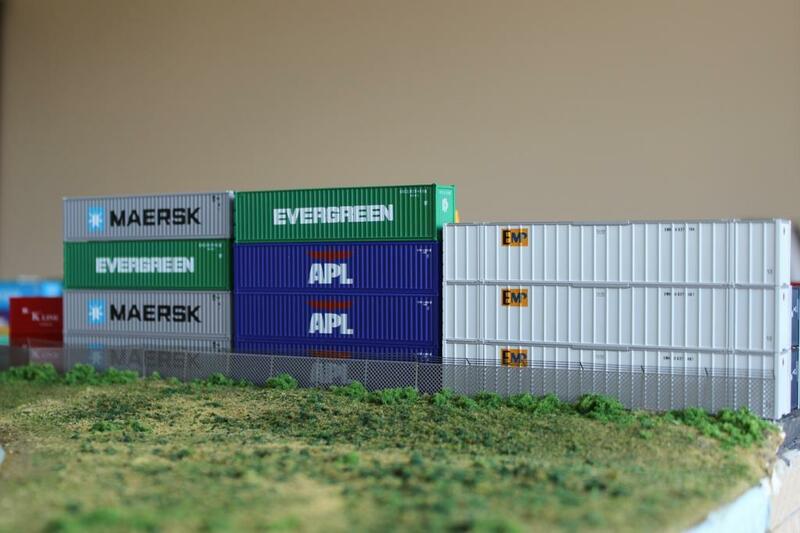 Unitram track was used for the intermodal yard as I was not satisfied with any of my attempts at creating inlaid track. The backdrop will follow the curved red line drawn on the foam. Benchwork was initially proposed to just be a foam base; however, a year into the project it became apparent this was insufficient as the layout was beginning to sag in places. My assumption is that this was due to the ½” foam sheets, even when glued together to a 4” thickness, not being as strong as 2” sheets. Unfortunately, 2” foam sheets are not readily available in the Houston area for me to test this theory. So instead, this week I built a base using 1”x4” boards as pictured below. I then adhered the top 2” of foam to the base and placed it back on the air hockey table. We are now sag free. Work in the coming days/weeks will consist of adding legs to the layout so it does need to rest on the floor when the kids play air hockey; completing track feeder and turnout wiring; and finally gluing track in place. Then we can begin scenicking. More posts/pictures to follow as work progresses. 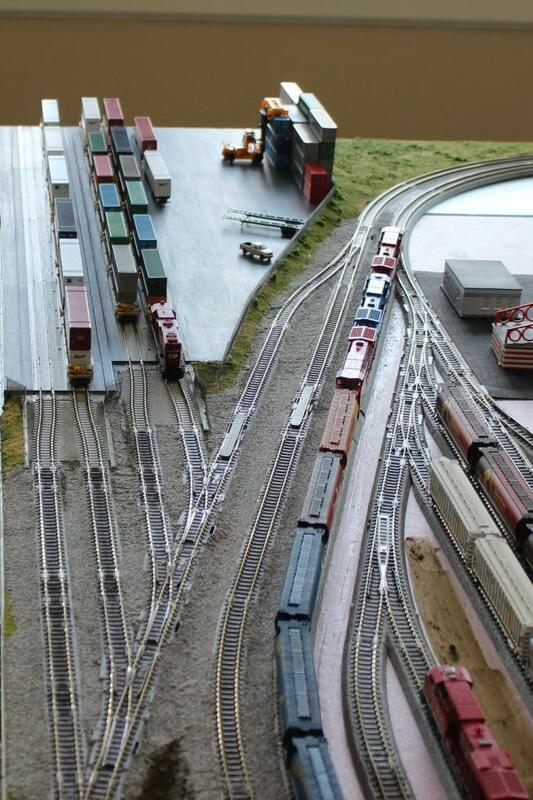 I like your plan refinements, this looks like it will be a very satisfying layout, both to operate and to look at. I am eager to see the mountains growing on the one side! One thing I might suggest is that you cut or erode away a bit more of the foam on at least one of the approaches to the bridge, so that it looks like the main runs on a bit of an embankment for some portion. In your photo, I would suggest doing this on the right end of the bridge, and let the topography be a more gentle slope aside from the 40-degree slope up to the main line. This will give you a nice vantage point to be able to watch and photograph trains crossing the bridge, plus it sets up some visual contrast: the shallow slopes make you appreciate the steeper slopes elsewhere. I like this , especially since in the last 2 weeks I been keeping a secret , I tore up all my bench work and ordered the v16 track kit (arrived today) and have been going like mad on Scarm tweaking the Salt lake Route to my liking . 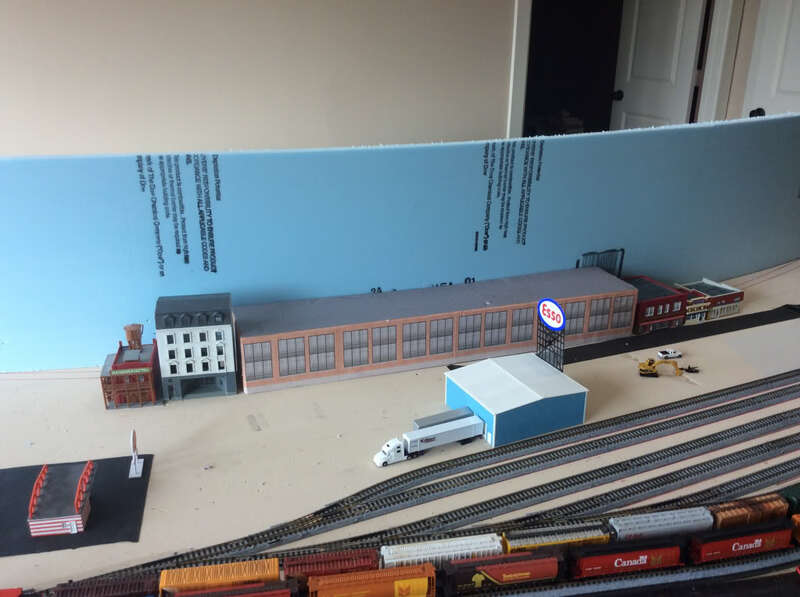 I too am adding a little staging yard next to the intermodal area , and I went with the v16 kit for the larger radius curves , 18 7\8" and 17 5\8" versus the plan with v11 pieces at 16 3\8" and 15" . This is cool , I get to see another variation of the plan come to life ! Overall , mine will be a little over 10' in length and vary in width as if left rectangular it would be over 5' and that's too deep on each side , trying to keep the 24" rule as much as I can and ease the curves wherever possible . I have added legs to the layout table. 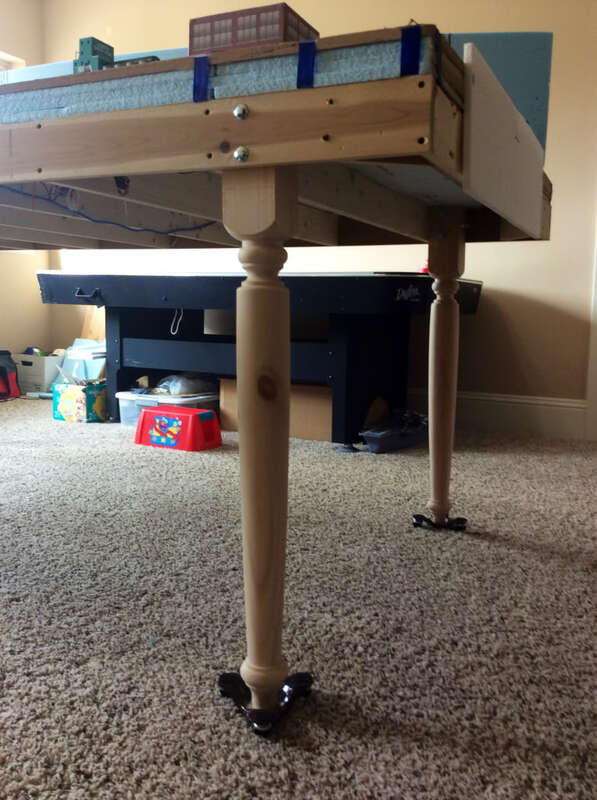 After debating how to construct legs to support the layout and have it free standing, I had an epiphany (the first of two this week) in the aisles of Lowe's: why not just use ready-made table legs? It turned out to be a simple, yet elegant, solution. Granted, it did cost a bit more than making my own legs, but they were quick and easy to install, and definitely beat 2x4s in the looks department, which helps alleviate some of my other half's concerns of the 36 sq. ft. monstrosity that occupies prime real estate in an open area of the house. An added bonus to the now free standing layout is that we were able to move the air hockey table against the wall. The layout can slide over the air hockey table when not in use, allowing the kids to have a much bigger space in which to play. Looks good. Well supported from what I can tell by the 3 bolts 90* to each other. I take it those are carpet gliders the legs are sitting on for easy movement? There are actually four bolts per leg. The two on the inside are spaced horizontally, so the fourth bolt is blocked in the picture. The table legs are sitting on swivel casters for easy movement. The table legs are sitting on swivel casters for easy movement. I've not seen these before. But I usually shop at Home Depot or Rona. Thanks for the link. Other work this weekend included running all the track feeder wires as well as drilling holes to hide all the turnout wires under the layout. 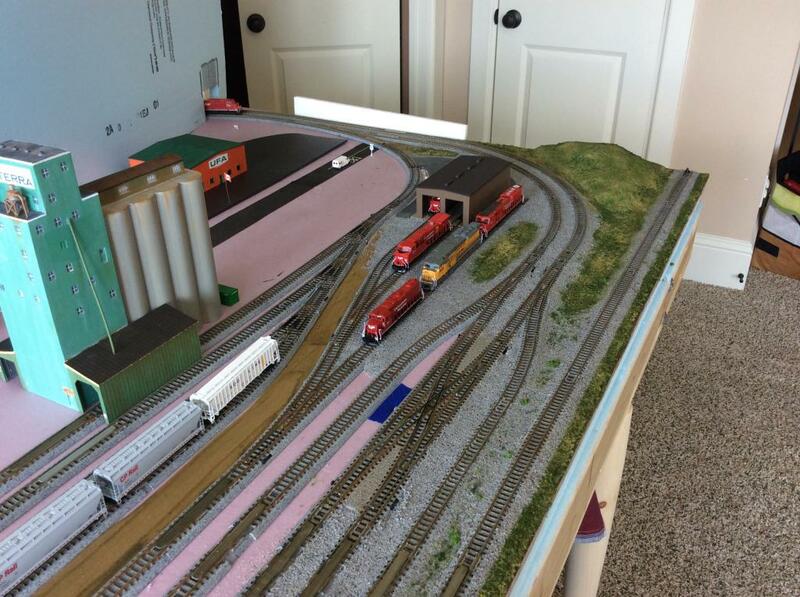 The whole layout was previously running on only one set of feeders for each of the mainline tracks. I was surprised at how well it ran in this configuration, hence why it took so long to get to the wiring. I have also been busy painting rails using Folquil's track color pens. 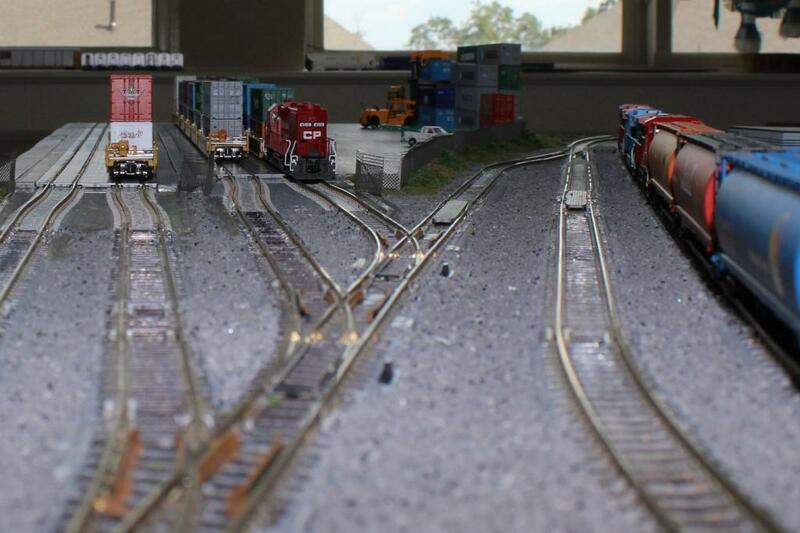 The mainlines, intermodal yard, and interchange track have been completed, the yard and engine maintenance tracks still need to be done. The red lines mark the previous location of the backdrop. The building is made from cardboard with some printed warehouse type windows glued to it. It will have to do until I can build something more elaborate. An added bonus if I stick with this is that I don't need to have a removable mountain top to access the tunnel. While reaching this track from the town side of the layout may be an issue for some, my ape-like arms can easily reach the tracks should the need arise. 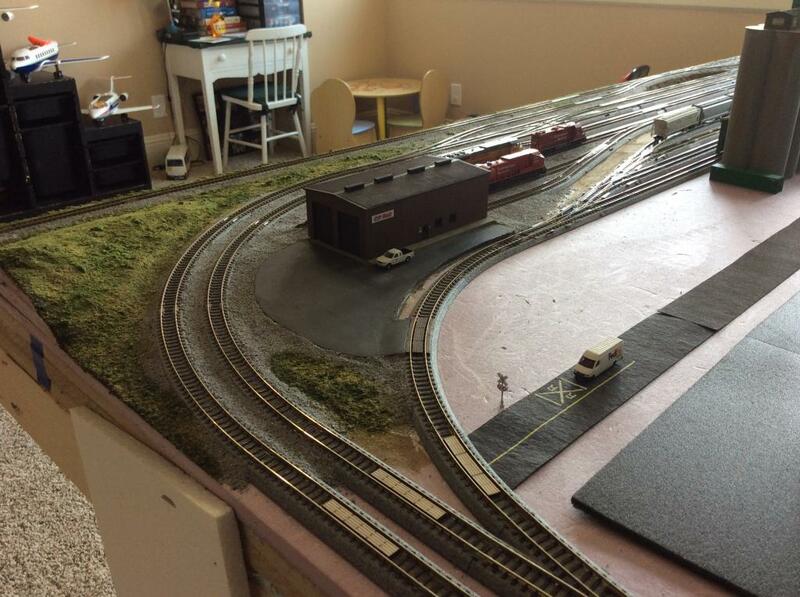 On the other side of the layout, I was never overly happy with the creek disappearing into the mountains. I could never envision how I would properly do this, so decided to do something about it. Having acquired a two-pack of Kato curved viaduct to add a bridge to the town side of the layout, I used the second piece to add a second bridge to the mountain side and have the river meander to somewhere off the layout as opposed to into the backdrop. The viaduct has been painted engine black to pass the at a distance test, but it does still need some work. That is it for now. Apologies for the iPictures, but both of my SLR batteries were dead, so it was this or no update for awhile. I'm not sure how much progress will happen in the next few weeks as my time will be filled with hockey tryouts this weekend and then we will have out-of-town guests for the next few weeks. I look forward to watching your progress. It's probably a good thing the V16 set was not available (or that I was not aware of it) when I bought my track. I initially received approval to build only 3-4'x8' layout and pushed my luck to get it to a full 4'x'9' rectangle. If my wife came home to 5'x'10', I'd probably be back to an oval on the boys' Thomas the Tank Engine table, or a full room layout in my new bachelor pad. I'm not a fan of the curved girder bridge, though. Such a bridge design doesn't really work in the real world, and they tend to use straight-edged segments instead. I could easily see this being three segments, resting on fat concrete piers; the middle span would be the one that goes over the stream, while the spans on either side go over the banks and floodway. The general size/depth of the girders you have feels about right for a ballasted-deck bridge. I just think it needs to be segmental or faceted. EDIT: I gather from re-reading that this curved bridge is a standard Unitrack piece, so it's their error not yours! It's not that a curved girder cannot be done, it just isn't structurally efficient, and wouldn't be attempted without a dang good reason. There's no dang good reason in this scenic context, so it seems to me that they'd have just done straight spans to intermediate piers. This may require some old-fashioned kitbashing, but making a bridge here should be fun. WP&P, I agree completely about the bridge. As a civil engineer, and one involved in roadway design and construction to boot, I will not likely be satisfied long term with that particular bridge. It is also quite long to not have a centre pier. The shape of the piece is more reminiscent of a freeway ramp than a rail bridge. Although I do feel it works well as a proof of concept that running the creek off the front of the layout is better than having it disappear into the back drop. 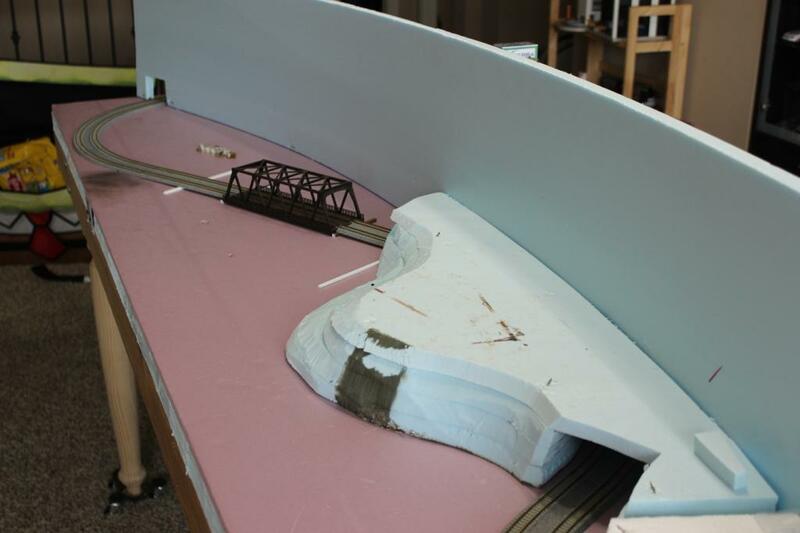 I had purchased the Kato viaduct as a temporary measure for a planned bridge on the town side of the layout until I could kit bash something else together as it was relatively inexpensive. Looks like I'll have two bridges to build now. In Kato's defense, I believe their intent for the piece is for an urban commuter train setting as opposed to how I have used it. Well, I've finally had some time to take some photos and post an update. 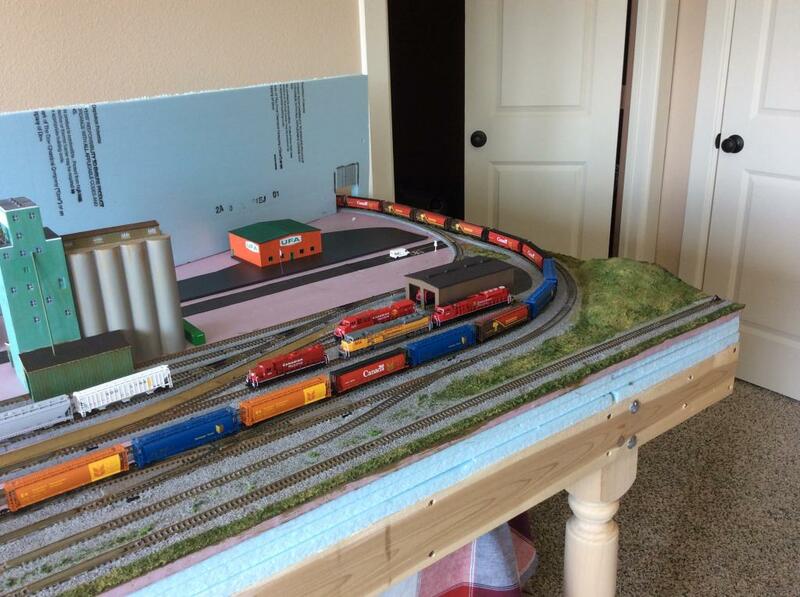 As I was still unhappy with the scenic side of the layout, I decided it was time for a do-over. 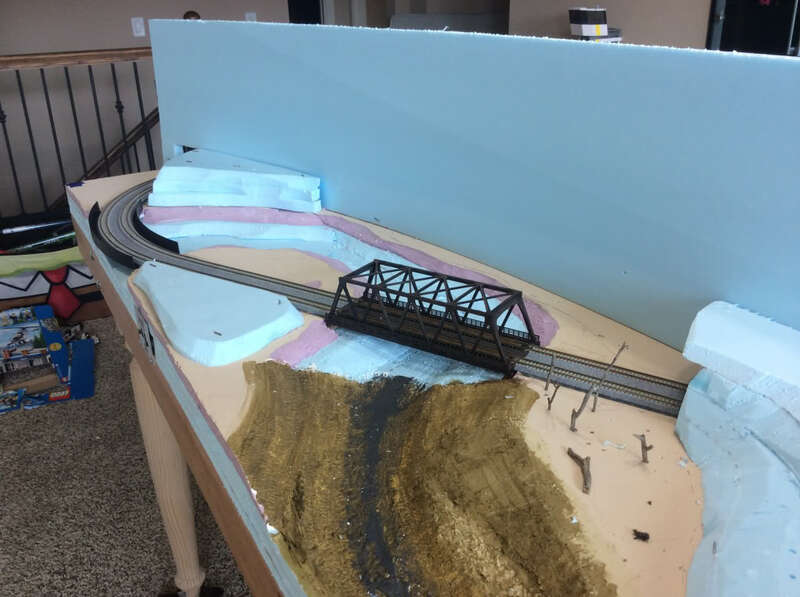 While I like the thought of having two bridges on that side of the layout, crossing the same river/creek twice within 1000' seemed somewhat unprototypical, at least without providing some very dramatic scenery to force the issue. So, I filled in the river valley with Great Stuff expanding foam and placed a new sheet of foam (1/2" because that's all you can get in Houston for extruded polystyrene) and now have a blank slate to work from. 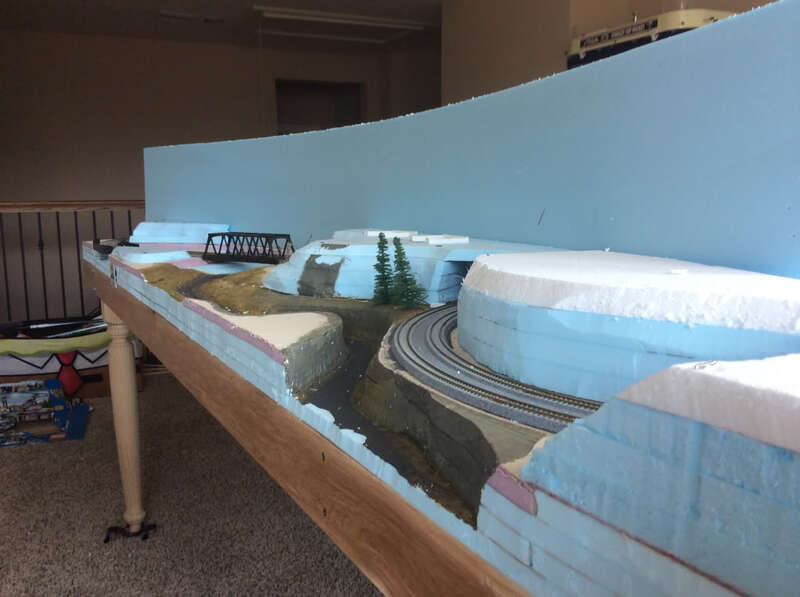 The next step for this side of the layout will be to start carving some mountains out of foam to see if I can make the river disappear into the scenery. On the town side, I replaced all the #6 turnouts in the grain elevator yard with #4s. 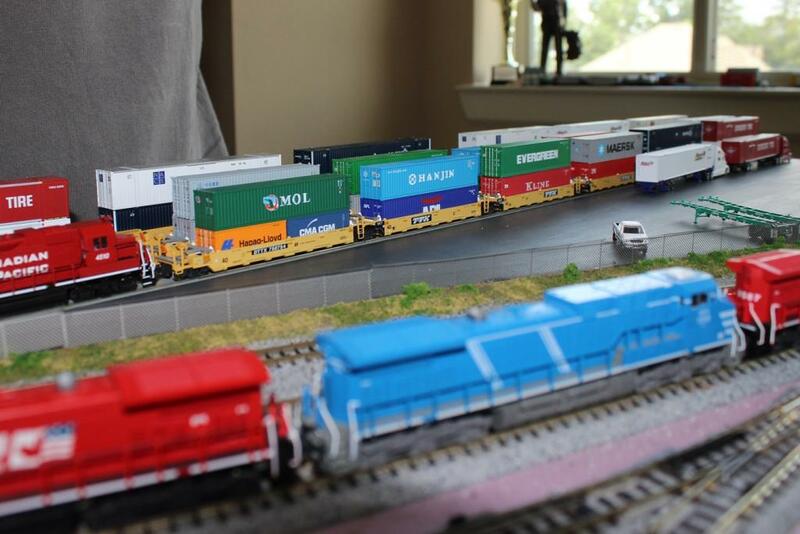 As troublesome as the Kato #4s are, it has given me room to store a few extra cars as well as given more space between the yard and the lead track to the engine facility. [It seems in my haste to post I neglected to take a photo of the yard as it now sits.] 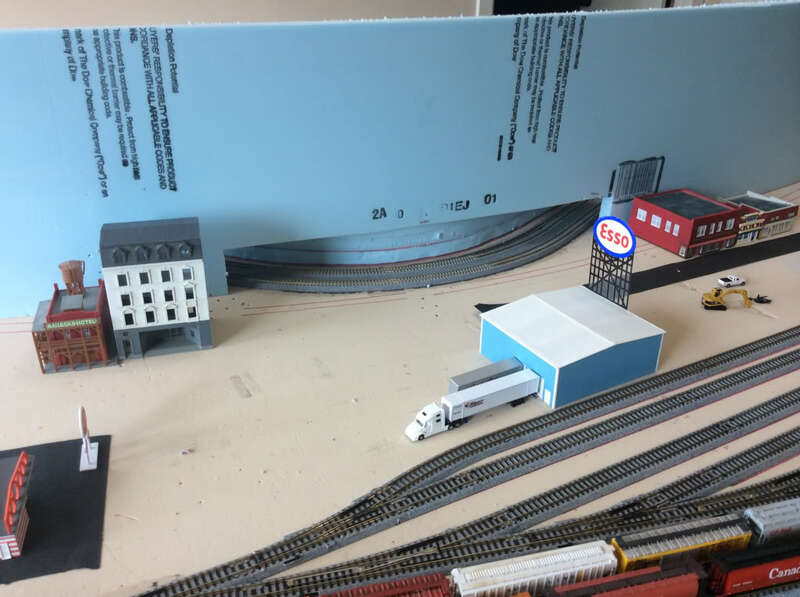 Also, I was able to squeeze in a third track for loco storage at the engine facility. Speaking of the engine facility, I picked up the two-bay enginehouse from Rix. 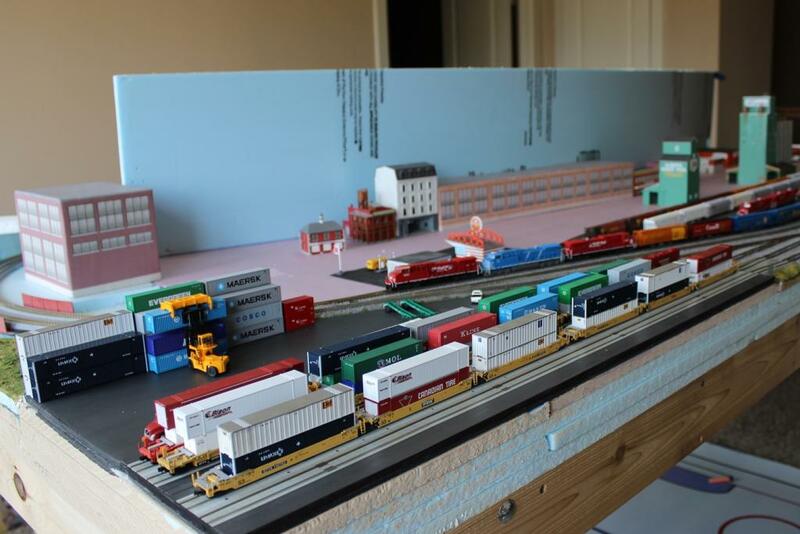 This size of facility seemed more appropriate for my layout size wise than the larger Walthers facilities. As well, it only has two small windows so I don't feel compelled to model the interior. 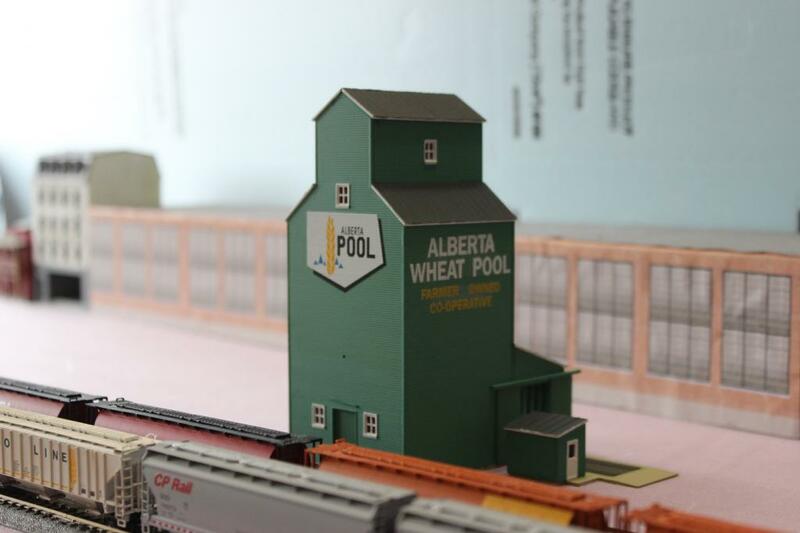 Another new addition to the layout is a Walthers Cornerstone Farmers Co-operative Rural Elevator. I painted and decaled it in Alberta Wheat Pool colours, but have decided against weathering it. As a lot of the elevators of this vintage are being torn down, some are being preserved as museums. 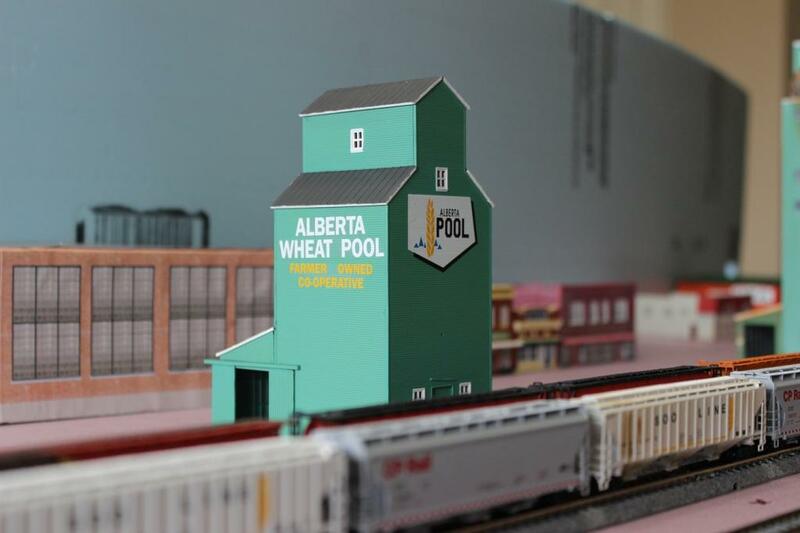 So the Spring Creek Historical Society is proud to unveil the restored Alberta Wheat Pool Spring Creek No. 1 Elevator. 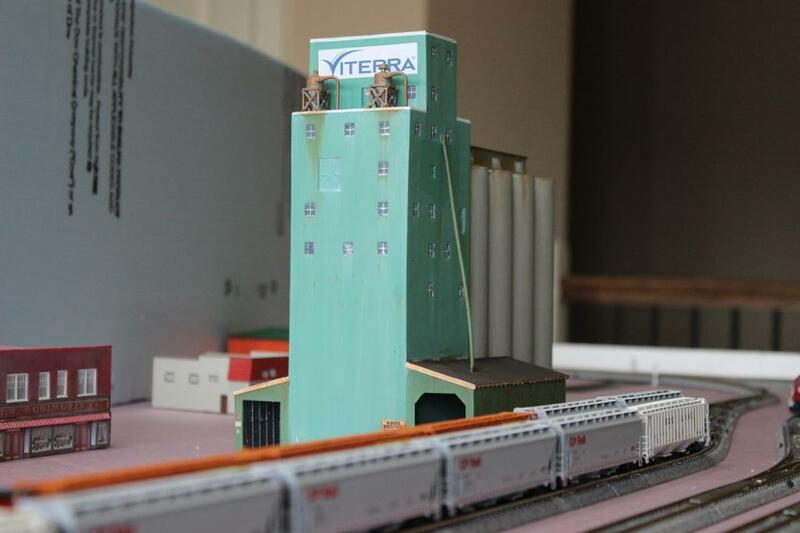 As I now have two elevators on the layout, the "newer" elevator received a healthy dose of weathering as well as a rebranding to Viterra to reflect the modern times depicted on the layout. I have also repurposed my other Rix building as a UFA store. 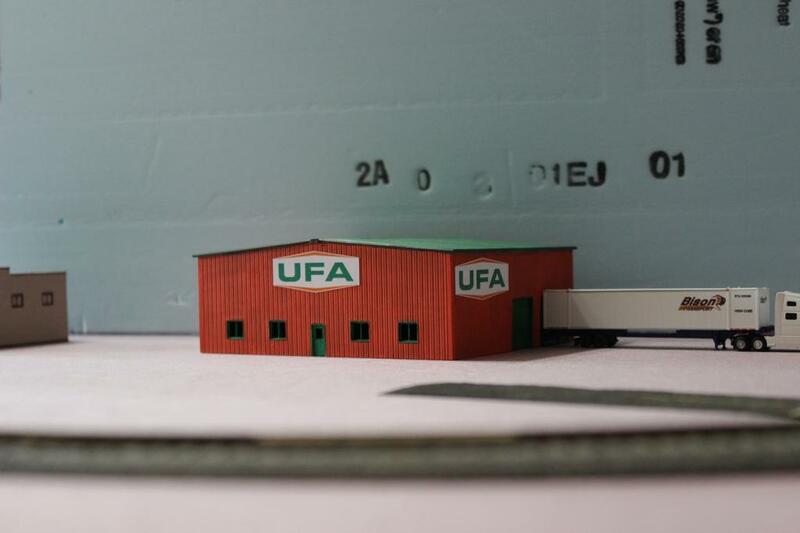 UFA is a farm supply store that is quite common throughout Alberta. Now hopefully I can go less than a month before having anything to report. Hmm. It also appears I already have some fence repairs to do. This may be the last progress for a bit as on Thursday we are heading back to Canada for ten days. Looking really really good . You have created a very nice scene with many great details and the pics are fantastic , great inspiration ! Pat your self on the back , 18 months of well spent time !! This is progressing into a really nice layout. I'll be checking back to see how it matures. I didn't know kato made track in concrete like that, and at a different spacing than their standard track? But it looks like they have an adapter piece and everything. Ahhh!! Just straight sections of unitram! Very smart, I'd never think of use that for a not-tram. Perfect! By MetroRedLn in forum Layouts, Design, & Planning. By Herc Driver in forum Layouts, Design, & Planning. By AC4000 in forum Layouts, Design, & Planning. By TwinDad in forum Layouts, Design, & Planning.